Maybe you've raised chickens already and are now thinking about plump, juicy turkeys for Thanksgiving and Christmas. Or maybe you're a small farmer with a business plan that involves raising, butchering and selling animals for meat. Whatever your reason, you're considering raising turkeys, and wondering if they're a good fit for your small farm or homestead. Perhaps it's a silly question, but it's always a good idea to spend some time around a farm animal before you invest in the housing, fencing, and other supplies you'll need - and before you get live animals that you're not so happy about. Go visit some farmer friends who keep turkeys. Talk to them about their experience. Feed the turkeys and hang out with them a bit. Whether you're adding a new species to your farm or just another raised bed to your farm garden, you should consider whether you have the time to devote to caring for the new addition. Turkeys are not that hard to raise, but they differ a bit from chickens in terms of what they need, and raising them from poults (baby turkeys) is more time- and energy-intensive than raising chickens from baby chicks. If turkeys are the first animal you're considering adding to your farm, then you'll want to think about the responsibility of raising and keeping farm animals. They'll need daily feeding and watering; the coop will need to be cleaned; and if you're raising them for meat, you'll need to find someone to slaughter and process them, or do it yourself. Turkey poults should be raised separately from chickens, not in the same coop or pen, for a couple of reasons. First, there is a risk of a disease called "blackhead disease" that chickens can give to turkeys. Secondly, chicks mature more quickly than turkey poults in terms of being oriented and aware of what's around them. So when chicks and poults are several days old, the chicks may start picking on the turkeys, possibly wounding and even killing them. And thirdly, when the turkeys get a bit older, they are much bigger and more aggressive than the chickens, and sometimes attack the chickens or pick fights with roosters. There are also different requirements for feeding turkeys compared to chicks (they need higher protein). For all these reasons, you'll want to have a space for your turkeys that is somewhat separate from the chickens. Turkeys require about a 10 by 10-foot space for raising ten to twelve-day-old poults, and as they get larger, they will need more space. Turkeys do best on range in a large fenced pen, but they also need some shelter from the weather. Turkeys require about one-eighth acre or about 75 feet by 75 feet for one dozen turkeys. Although many cities now allow residents to keep chickens (typically hens), there may be restrictions on other poultry such as roosters, geese, ducks, and turkeys. You'll need to check with the municipality in which you live to find out if keeping a few turkeys is legal. Another question that should always be asked when adding to your farm is whether you can afford the expense involved. 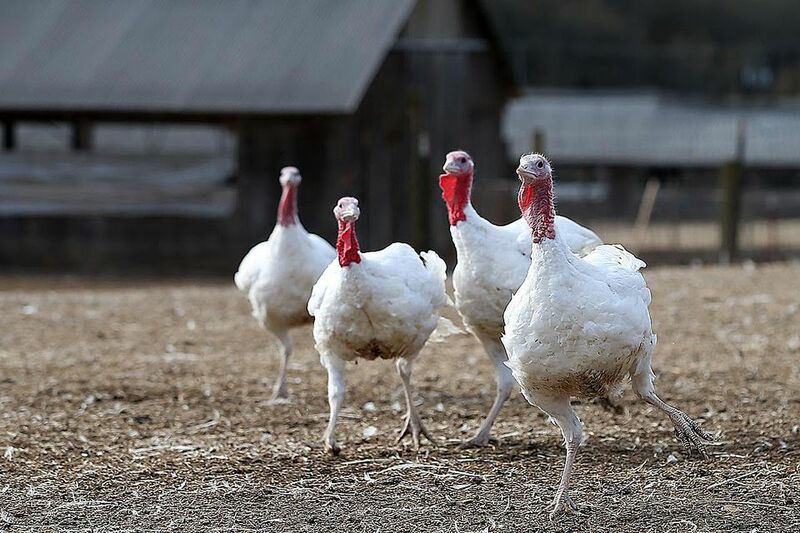 Turkeys will require a pen, housing, feeders, and waterers, and turkey poults themselves can be expensive - and not all of them will make it to full-grown turkeys. When considering whether you can afford to raise turkeys, look at your overall farm business plan and your long-term goals for your small farm business and see how turkeys fit into it. If you're homesteading, you might want to start on a very small scale, experimenting with turkeys by sectioning off part of your chicken coop for them, and test how turkeys fit into your overall homesteading goals without making a large financial investment.